1. Display units - distance units, temperature units, power , pressure, and Mass. 2. Data necessary to calculate power. 3. Variables to show on the Dials on the Live data page. 4. Configure the alarms, Currently up to 5 alarms can be configured. 5. Selecting a lap file to be used with the run data. 6. 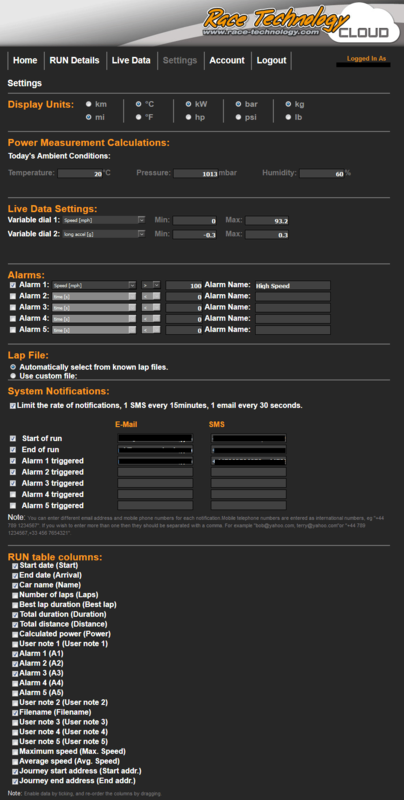 Configure System notifications based on start/end of runs and alarms triggered. You can enter different email and mobile phone numbers for each notification. You can select which columns to display on the run table on the Home tab by using this section. You can rearrange column order by dragging and dropping the columns to desired location.